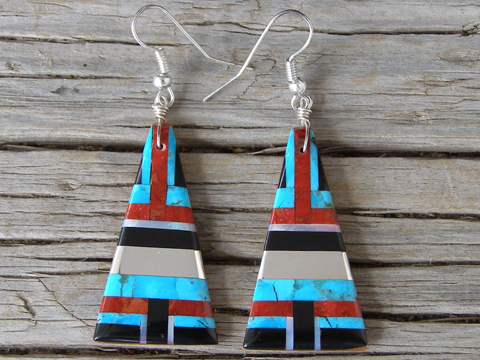 We've been buying Daniel Coriz' turquoise slab earrings and mosic inlay earrings since 2003. His tiles are perfectly cut, fit and polished and his complex patterns show perfect symmetry of design and incomparable color combinations. A horizontal band of channel inlay Sterling complements the stone and shell tiles. Daniel's workmanship puts these in the "fine jewelry" category. Wear these with jeans, or with pearls and cashmere. On Sterling hooks. Dimensions of drop: 1 1/2" x 13/16"